Large No. of American Population is on roads these days to protest against Poverty, Unemployment and Capitalism. 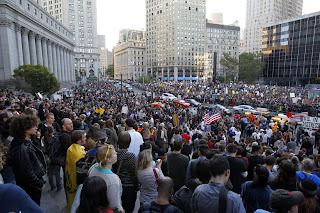 Many Americans are also doing protest in-front of American Financial Hub Wall Street which is named as Occupy Wall Street Movement. At same time Many Americans are also doing protests in other cities of United States. American Muslim Population is also supporting Occupy Wall Street Movement. Many Muslims are present at Occupy Wall Street doing protest along with other Americans everyday. On Friday Muslim Protesters also offered Jummah Prayer at Occupy Wall street. The Protesters are demanding for complete change in system and end of all wars like Iraq and Afghanistan.